In the classic collection, the paper used is a delicate ivory coloured parchment for a classic, timeless feel. Please click on any of these photos to enlarge. Any message, poem, prayer or Bible verse can be printed on your parchment scroll and you can also personalise it with names and dates. A proof will be emailed to you after ordering to ensure you are completely happy with the layout before printing. 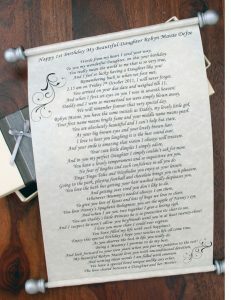 The scrolls are made in 3 different sizes depending on the format and length of the passage to be printed. They are available either with or without dowels/finials (the rollers at the top and bottom of the scroll). 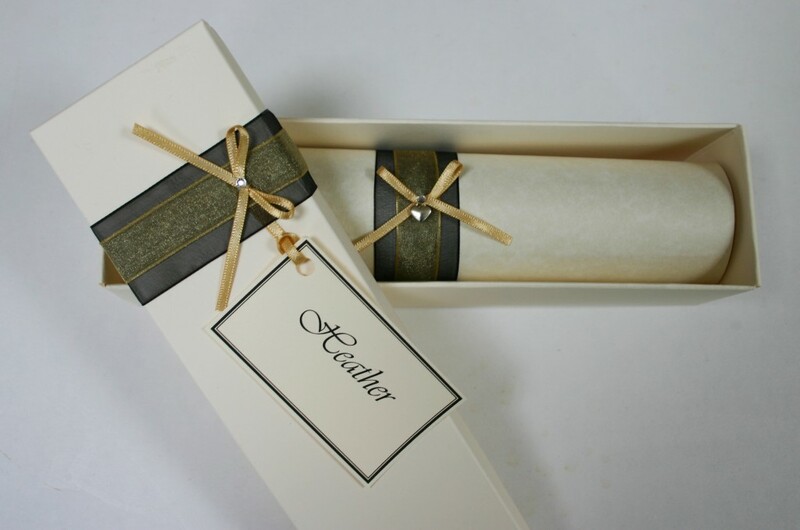 If you would like to have the option for the recipient to display the scroll, you could have a ribbon attached to make it into a hanging scroll as pictured below. 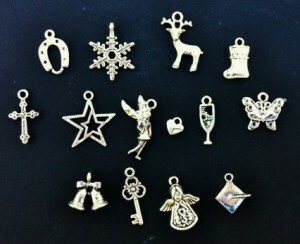 Please just specify this on the order form, there is no extra charge for the hanging ribbon. There is a choice of fonts for the classic range, please click here for more details on this. 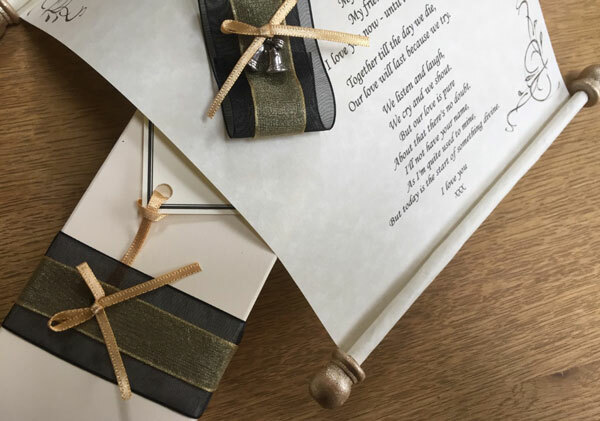 All the classic scrolls are trimmed with ribbons and a charm, and presented in an ivory coloured scroll-box with coordinating ribbons and gift tag, which can be left blank for you to write your own message, or I can print a message onto this for you at no extra charge. 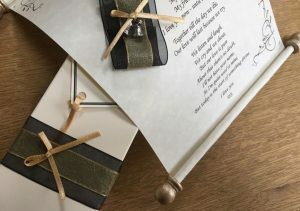 The coloured ribbon is laid on top of a sheer black ribbon, the choices of the coloured ribbons are dark pink, royal blue, silver, gold or red. 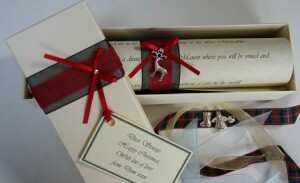 It may be possible for you to have another colour ribbon, please specify this in the order form. If you would like to order one of these scrolls from the classic range, please use the order page. After you have filled in the order form, you will be taken to Paypal; this is a secure method of payment and you don’t need a Paypal account in order to use this. After payment has been made, I will email a proof of the scroll to you to ensure you are happy with everything before printing. 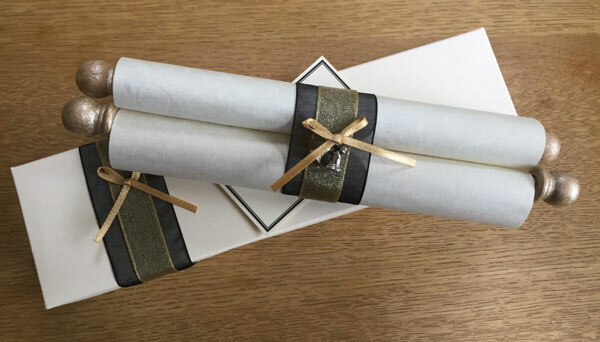 Any order over £50 will be sent guaranteed next day delivery which is a tracked service, otherwise your scroll will be posted first class Royal Mail. 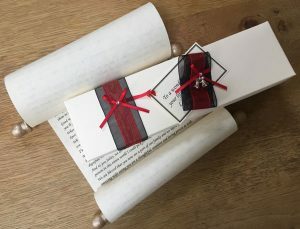 If you are unsure about the size needed for your scroll, please order the size that you think is the most appropriate, and then submit your order form, but don’t continue onto the Paypal payment site; I will then have a look to see which size is best and email you a Paypal invoice. Below are a selection of Bible verses you might like to use for your scroll. 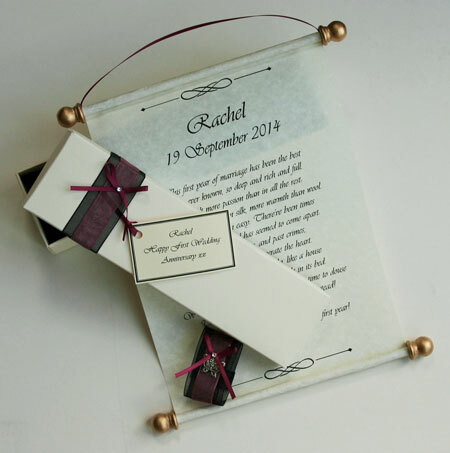 These make a perfect Christian gift for all occasions such as Baptism, Wedding, Confirmation, Birthday amongst many others. Browse by occasion, about or by Biblical reference for inspiration.